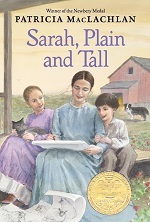 19th century tale of a widowed farmer with two children who advertises for a wife. The answer to his ad is Sarah, who arrives from Maine. The tale gently explores themes of abandonment, loss and love.